RICHMOND, Va. (AP) _ Federal prosecutors say there is easily enough evidence to support former Virginia first lady Maureen McDonnell’s public corruption convictions. In court filings Thursday, prosecutors told the 4th U.S. 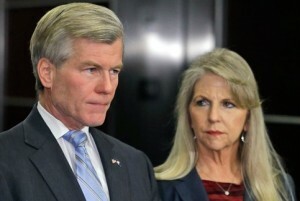 Circuit Court of Appeals that it is clear McDonnell took illegal steps to benefit a wealthy vitamin executive who lavished McDonnell and her husband, former Gov. Bob McDonnell, with low-interest loans and expensive gifts. McDonnell has argued that her convictions on multiple corruption charges are based on an overly broad definition of bribery. But prosecutors said Thursday that her arguments show a “fundamental misunderstanding of bribery law.” A jury in September found the McDonnells guilty of doing favors for former Star Scientific CEO Jonnie Williams in exchange for more than $165,000 in gifts and loans.